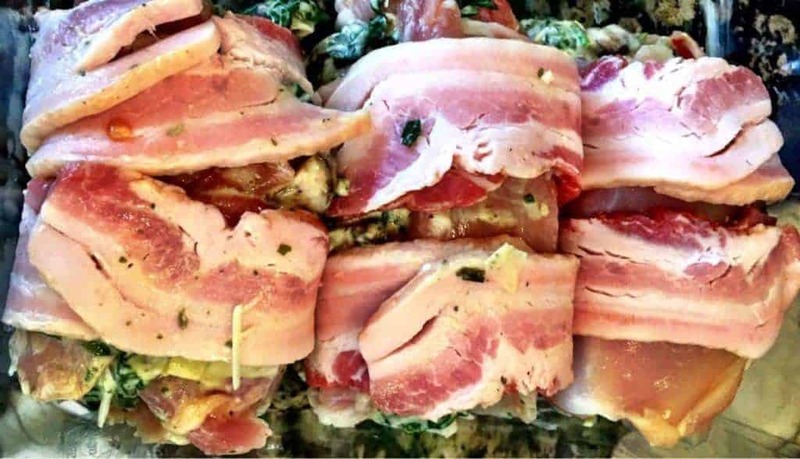 This Bacon Wrapped Pesto Chicken Bake is a low carb symphony of flavor you’re sure to love. It’s loaded with pesto and cheese, wrapped in bacon and it’s keto friendly. What more can you ask for in a dish? Okay, the photographs completely do not do it justice. This Bacon Wrapped Pesto Chicken Bake was one of the more delicious things I’ve cooked in a while, and I did it by throwing together a bunch of different ingredients that I thought would taste good together–and by golly they did. 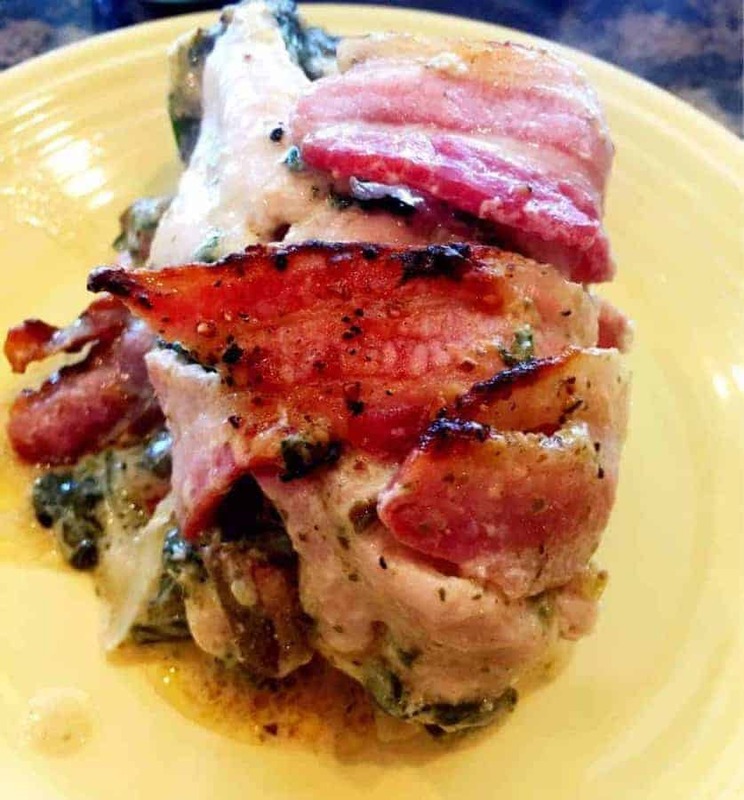 To make this Bacon Wrapped Pesto Chicken Bake recipe even simpler, I’m not even sure I would bother with rolling the filling into the chicken the next time. The flavors taste good together, but really, the filling didn’t stay in the chicken as well as I had hoped. So if you want to make this easier on yourself, just wrap up chicken thighs with bacon, and put in on top of the filling and have at it. 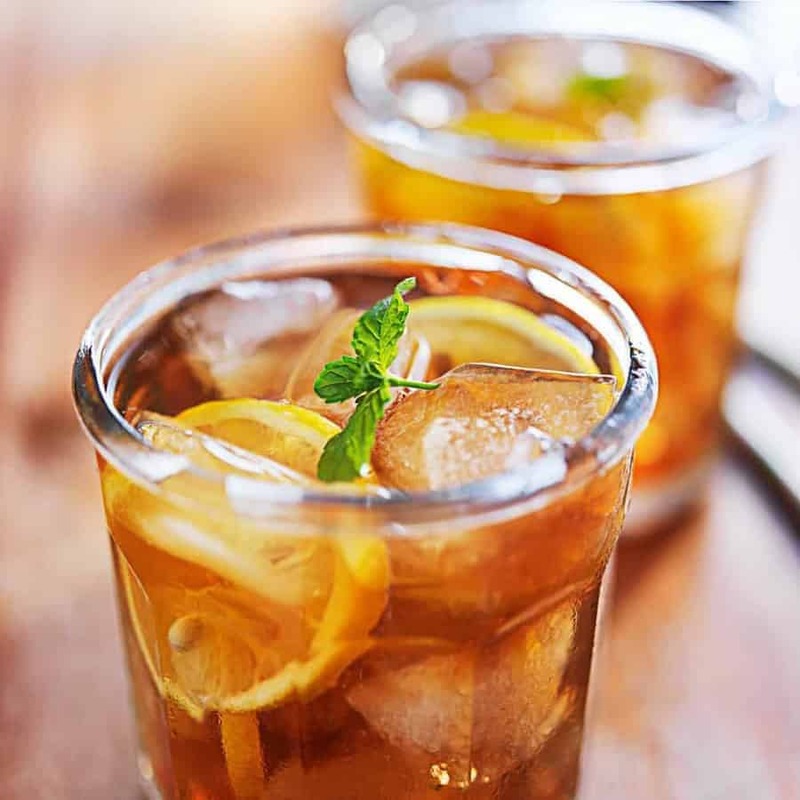 If you’re looking to wash down all this savory with something sweet, check out my Instant Pot Iced Tea. It’s low carb as well so you can enjoy it on a keto diet! If you enjoyed this recipe and are a fan of pesto you’re sure to love my Air Fried Chicken Legs with Cilantro Pesto. It’s an interesting twist on pesto that will change your world. Anyways, this Bacon Wrapped Pesto Chicken Bake is kind of like having the best of bacon-wrapped chicken tenders and artichoke spinach dip all in one. How can you go wrong with that? This Bacon Wrapped Pesto Chicken Bake is something I threw togther because it sounded good, and boy was I right! Not to mention it's low carb. Mix everything except the chicken and the bacon together. 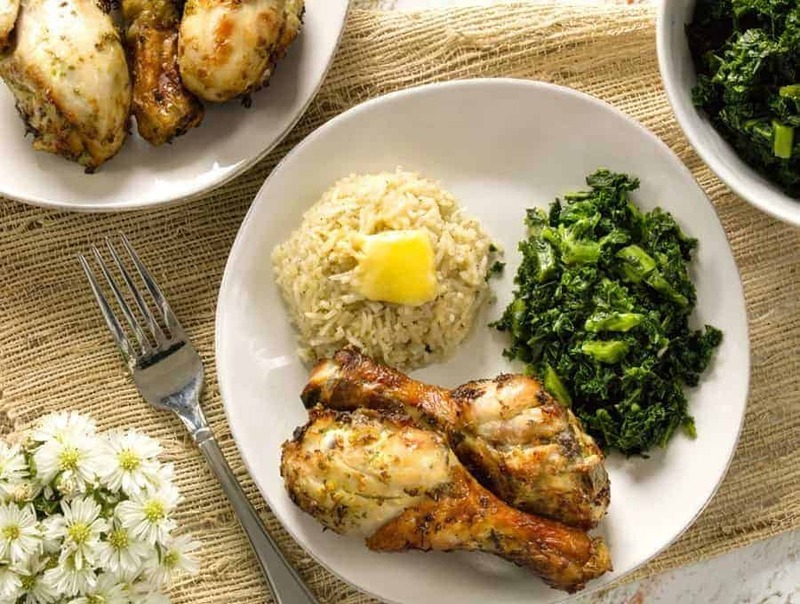 Open up the butterflied chicken thighs and spread the mixture on to the chicken. Roll it up and wrap each thigh with two pieces of bacon each. Place all the leftover filling on the bottom of a baking container and place the wrapped chicken thighs on top. Bake at 350 degrees for 30 minutes or until the chicken reached an internal temperature of 160-165 degrees. Turn on the broiler and broil until the bacon crisps up. Place into a baking container and place all the leftover filling onto one side of the container. 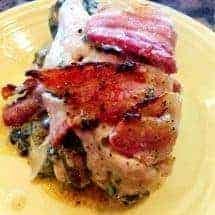 To further simplify this recipe, just wrap up chicken thighs with bacon, and put in on top of the filling rather than butterflying the thighs and taking time to roll the filling inside it. Adjust cooking time to ensure the chicken is cooked through.